San Antonio. This was my 7th show overall since 1993. Today I am tired. The SxSW music festival gets into full swing today and there are thousands upon thousands of visitors here. I don’t like to miss Motorhead when they play. All of their shows are pretty consistent and every now and then they throw a few older gems into the setlist. When I saw them last year, it was the first time I was ever even slightly disappointed in their show. They had Matt Sorum on drums and it gave such a completely different vibe. Last night it was great to have Mikkey Dee back behind the kit. The dude is awesome. When I got home from work I just sat down to decompress for a little bit. Then I heard Motorhead soundchecking. I opened my window and could hear Cradle to the Grave clearly. Sounded great. I was excited that it was going to be in the setlist! An hour later I went to the venue and met up with some friends and hung outside while Year Long Disaster played. I couldn’t really tell whether I liked them or not. I couldn’t hear the crowd cheer after any songs either. Weird. We went in as The Sword started. I’ve seen them before and I’m not a big fan. I did think it was cool that their second to last song was Thin Lizzy’s Cold Sweat. They did a good version but it was weird hearing it played tuned down. Motorhead came on and did a great show. They were steady, not overly fast…tight. Lemmy was funny and it was nice to see Phil active on stage. Last year he looked terrible. He stated that he was sick last time, so that made sense to his previous performance. Lemmy did his typical “this song came out before most of you were born” line. His statement was very true. Lots of younger folk in attendance these days thanks to VH-1 Classic, Rockband, Guitar Hero, etc. It’s really put metal and classic metal back in the forefront. That’s a good thing. 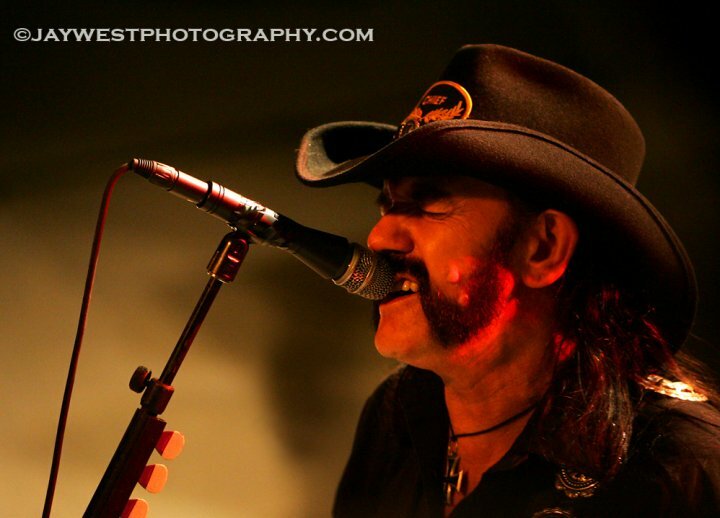 In the last show I saw in Virginia, Lemmy said, “Don’t forget us” before starting their final song, Overkill. He’s done it consistently since then. It always makes me feel like he’s on his last leg saying, “It’s almost over…don’t forget us when we’re gone.” He’s no spring chicken these days but he still seem to be pretty mobile. His brain is certainly still sharp. I think I am missing a song between Tragedy and Power. I’ve been in Austin since November 2006 and this is my 4th time seeing Motorhead. Three times have been at Stubb’s and the other time was in San Antonio. This was my 7th show overall since 1993. Today I am tired. The SxSW music festival gets into full swing today and there are thousands upon thousands of visitors here. yikes They had Matt Sorum on drums?!! not a fan of his style. esp. after Mikkey Dee. *I do prefer M.D. with King Diamond though, just fits him better IMO.